Geleen, Netherlands — Polyscope Polymers B.V. was awarded the JEC Innovation Award in the Automotive Application category. The company’s XIRAN SGH30EB glass-filled thermoplastic composite was specified by Webasto France and the Groupe Renault (Boulogne-Billancourt, France) for the roller-blind guide rails on the panoramic sunroof modules installed, since 2016, in Renault Scenic and Grand Scenic multipurpose vehicle (MPV) models. 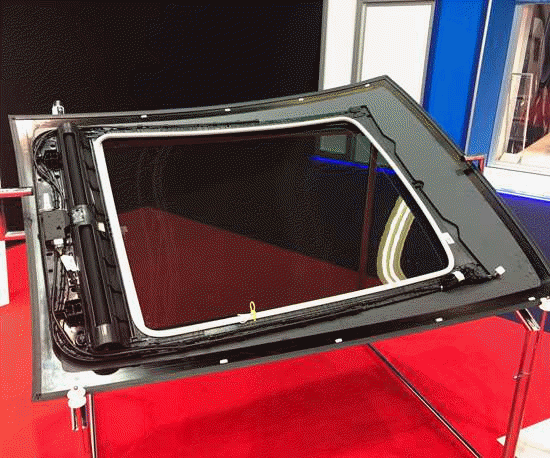 According to the company, this is a significant automotive innovation for the industry, being the first time that a thermoplastic composite material has successfully replaced aluminum for this type of sunroof design in a mass produced passenger car. “We are absolutely delighted and feel very honored to have won this prestigious JEC Innovation Award. It was a challenging application development for the Polyscope team, but we were fortunate to be working with outstanding, highly technical, design and engineering people in Webasto France and Groupe Renault and the specialist partner companies involved in this project,” says Ferdi Faas, business unit director at Polyscope Polymers B.V. According to Polyscope, the move from conventional anodized aluminum extruded profiles to thermoplastic composite guide rails freed up 13 millimeters of headspace for passengers and increased the angle of vision through the glass panel (called Daylight Opening). The XIRAN SGH30EB composite guide rails also, the company says, simplified the construction and installation of the sunroof on the Scenic and Grand Scenic vehicle assembly lines. In total, the project reportedly delivered a significant system cost reduction for the installed, improved design, panoramic sunroofs. XIRAN SGH30EB is a 15-percent glass-reinforced copolymer compound of styrene maleic anhydride and acrylonitrile butadiene styrene (SMA-GF). The formulation was optimized by Polyscope to ensure high bond strength with the polyurethane adhesive used to mount the glass to the module, and the module to the body-inwhite (BIW) roof structure. The material was also said to ensure that dimensionally stable precision parts with a high shot to shot consistency were injection molded, critical for the smooth opening and closing operation of the roller-blind system. The need to use a lubricating grease on the rail guides was also eliminated with the XIRAN SGH30ED material. At JEC World 2019, 11 Innovation Awards winners were announced in a ceremony on March 13. The ceremony was opened by Bertrand Piccard, the founder and visionary behind Solar Impulse, the first zero-fuel aircraft with perpetual autonomy.